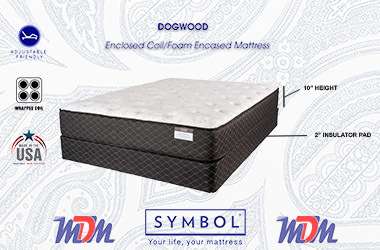 The Dogwood is a new addition to the MDM lineup and fits a slot in our lineup that is hard to fill: an affordable pocketed coil mattress with supportive and durable materials. 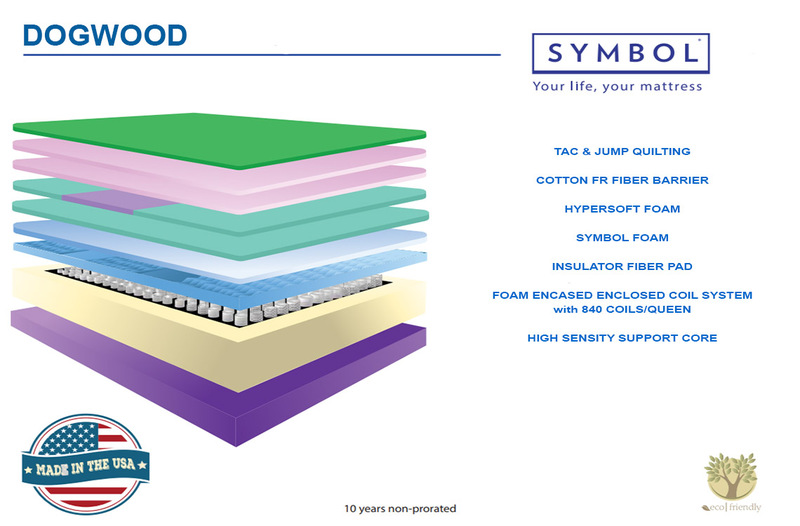 Symbol's HYPERSOFT foam (1") in this model provides a nice cushioning quality to the bed and both an insulating pad and high density (2") support core, to provide both stability and support. Despite its soft feel, the Dogwood looks to be a mattress that will last a relatively long time - for just about anyone. Due to their production cost and the demand in the marketplace, Pocketed Coil mattresses tend to be on the expensive side. With their 2019 lines, Symbol has addressed this issue and is providing relatively high coil count individually wrapped mattress models that are quite affordable. The Dogwood is actually considered to fall in the lower-mid price range. Symbol has some great-feeling and long-lasting foams to pair with its carefully selected spring units. This one features their HYPERSOFT foam and also their proprietary Symbol Foam. Over time, these staples have proven to be both durable and comfortable. This mattress is a basic-luxury mattress. What I mean by that is that it's a lower profile, minimum foam layers and a reasonable price point. However, it's got the updated (pocket) coil system, foam encased walls that decrease motion transfer and a High Density core.